Couples all over the world dream of having a destination wedding in beautiful Italy, and nowadays, more and more couples are turning those dreams into a reality. Some choose among Italy’s cities and cultural hubs such as Milan, Rome or Florence, others look for a more rustic and gastronomic experience in the Tuscan hills and or in one of Italy’s gorgeous vineyards, while the country’s grand historic sights are also an attraction for timeless romance. 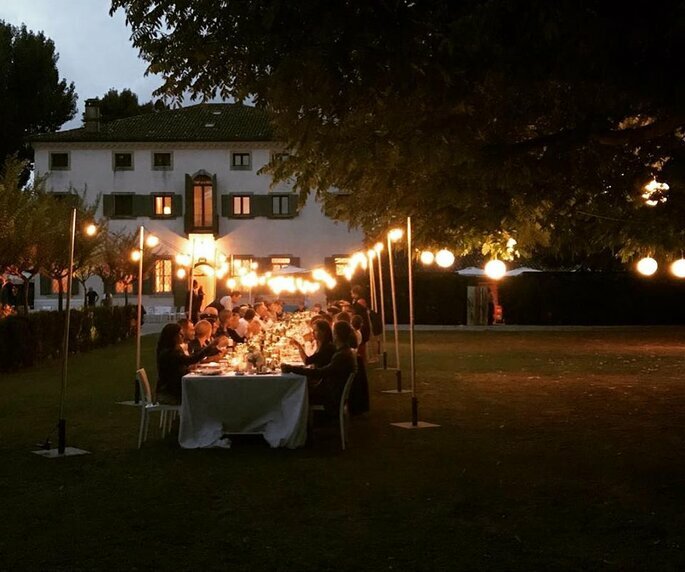 The reason that so many lovebirds choose to tie the knot in Italy is simple: there is so much variety, with beautiful spots to suit all different kinds of wedding styles. So we’ve made a list of the three most popular styles of destination weddings in Italy, with venue recommendations to match. All you need to do is consider the theme and essence of your dream wedding, and choose accordingly! If you’re a cosmopolitan couple that thrives off the glittering lights and glamour of cities, then Rome is most certainly for you. It’s a dynamic city that combines nearly 3,000 years of art and culture with the modern aesthetic of 21st century European life. With exquisite bridges, new high rise buildings, and the remnants of the ancient Roman empire, there will be loads for you and your guests to explore. Getting married with this varied cityscape as your backdrop will be simply magical. 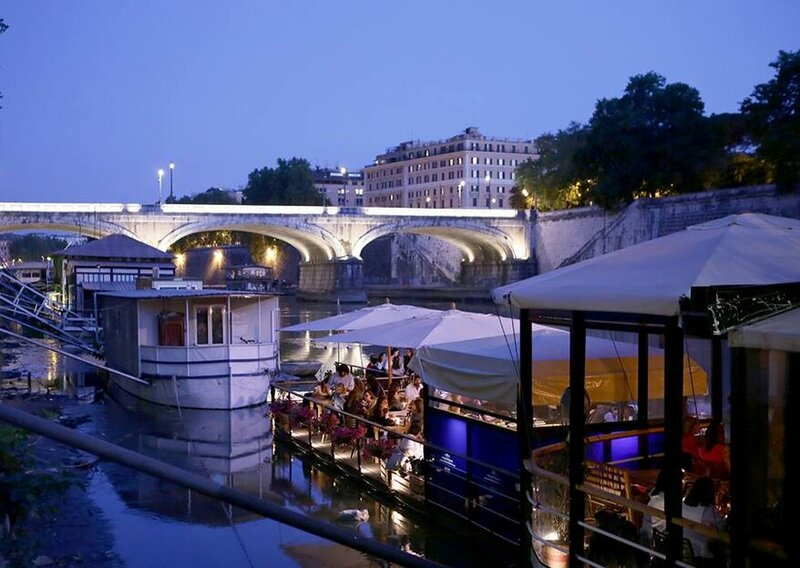 Our top venue recommendation for this style of destination wedding is Baja Roma, based in the heart of the city on the bank of the River Tiber. 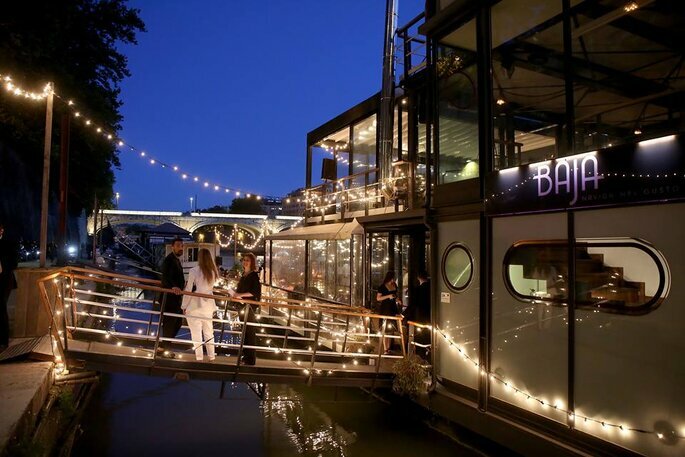 This space is both a boat and a restaurant/cocktail bar, suitable for any event or wedding. With a central location, Baja still provides a serene and tranquil escape from the hustle and bustle of Rome, with high quality food, wine, cocktails and music, not o mention the enchanting river views. Alternatively, if you’re looking at the incredibly romantic coastal city of Naples, check out Andris Hotel. With glamourous city views, it’s still immersed in the lush setting of the Vesuvius National Park. A quiet and reserved place that blends luxury with sophistication and innovation. Let you and your guests be pampered by the first class service, whilst indulging in delicious food and taking in the breathtaking views. 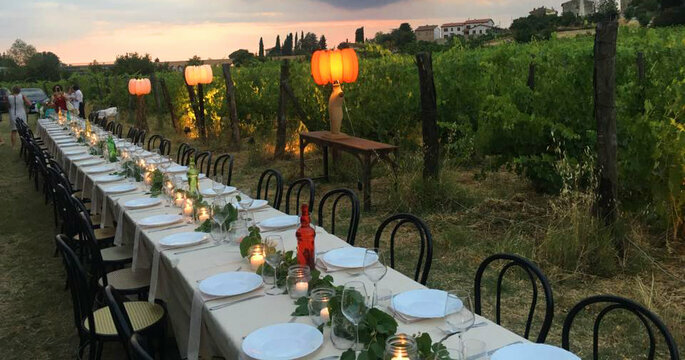 Italy is known worldwide for its delicious wines, so why not tie the knot in a lush green vineyard? This romantic option is perfect for couples that love to wine and dine, an experience that they can share with their awe-inspired guests. Tuscany is Italy’s main wine region, with rolling hills that overlook the stunning view of Florence. There are, however, numerous other wineries in gorgeous locations such as those surrounding Lake Garda. 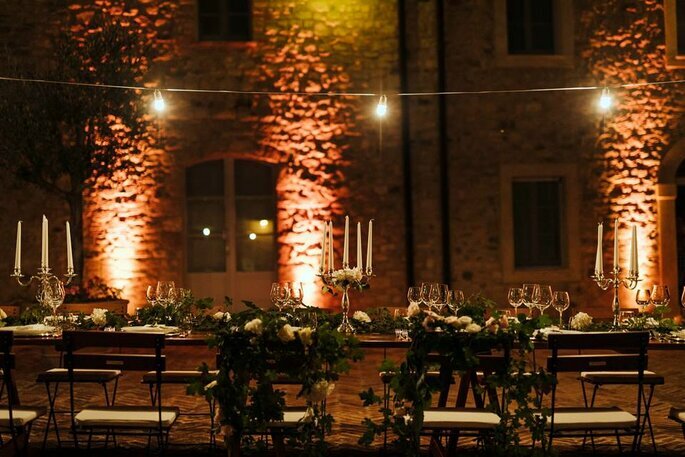 Our favourite winery wedding venue is Fattoria la Striscia, among the vineyards of Colli Aretini, just 1 km from the historic centre of Arezzo, Tuscany. 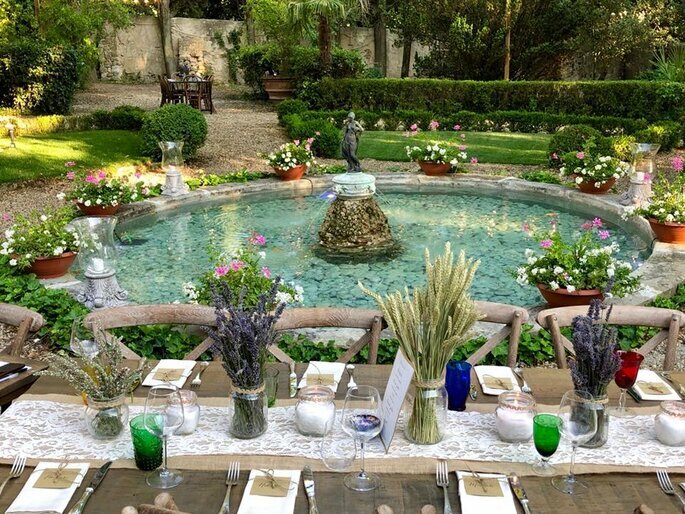 An exquisite farm venue that was established in 1500, expanded in 1700 and has since been restored into charming apartments and a luxury complex, with a swimming pool surrounded by vineyards. Their wedding venue, Alexandra Loft, caters for all events with seamless luxury. With an exclusive wine cellar on the farm, you can expect your tastebuds to be tantalised with exquisite Chianti wines. Or, if you’re looking for even more history, Borgo San Pietro Aquaeortus was born as a place of worship and fortress of faith for almost seven hundred years and then transformed into a medieval village – saved by a tragic destiny of degradation and destruction to be reborn to new life. 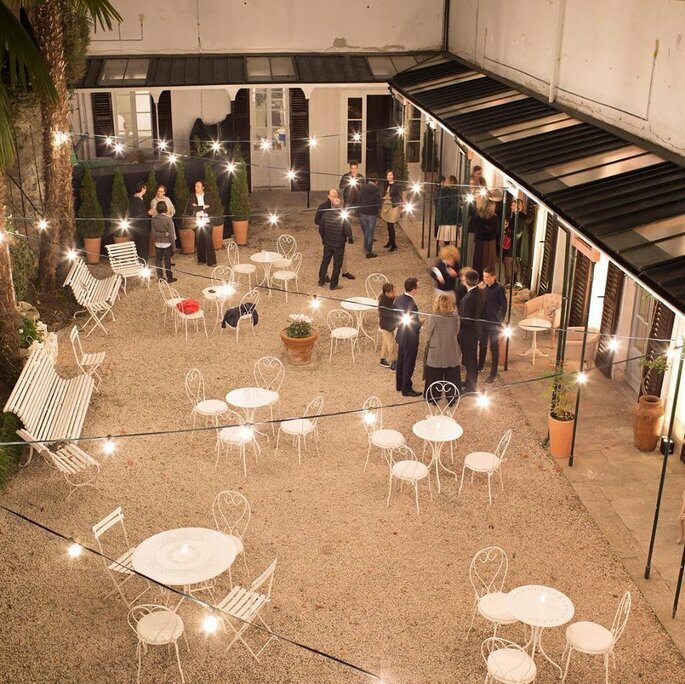 The large internal square, overlooking the valley below, is the heart of the Borgo the ideal space for weddings and events. The hotel has a restaurant, a wine bar and a conference room. 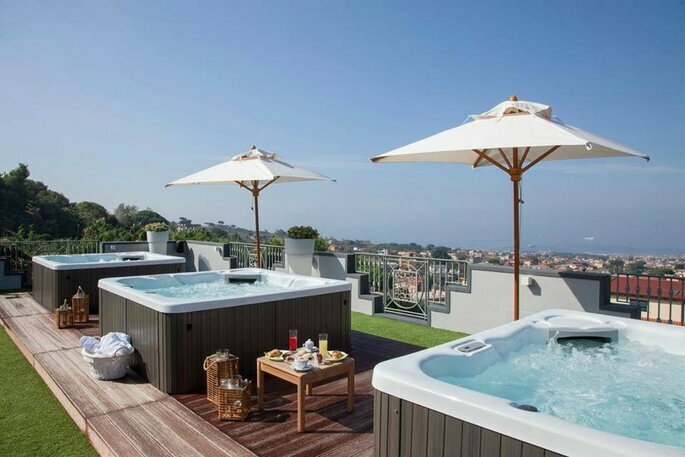 There is also an outdoor swimming pool, an indoor wellness center with a small seawater pool for thalassotherapy, a Turkish bath and a fully equipped gym! Italy is also famous for its historic dwellings: castles, villas, palaces, old convents, farms. Among these, grand Italian-style villas are simply perfect for a fairy-tale style wedding. Think Romeo and Juliet in Verona, think timeless romance, and imagine your special day surrounded by years of charming cultural heritage. These villas were built for the aristocracy, to welcome illustrious guests and to hold prestigious events… they now stand as beautiful as ever, waiting to be the receptacle of your wedding guests. 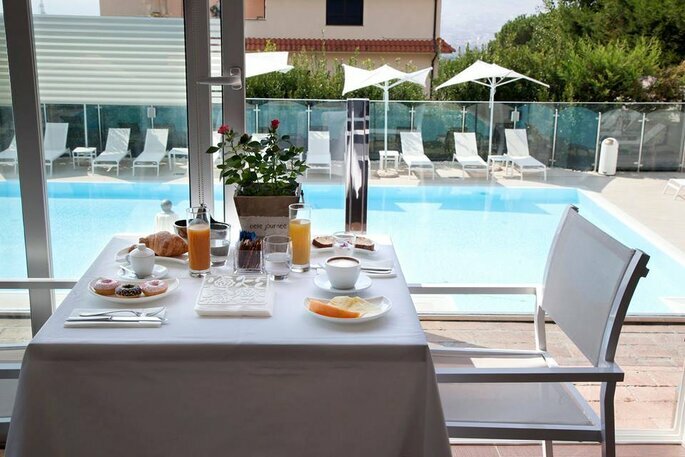 Villa Piceni is all of the above, and more. An authentic and grand rose-coloured structure, built in 1872. 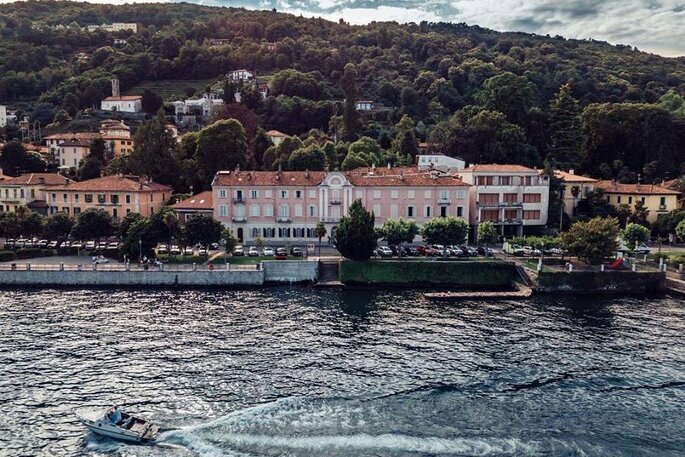 It is located in Verbania, a beautiful town on Lake Maggiore, benefiting from the serenity of its waters. The villa’s expansive lounges and ballrooms are used for banquets, while the courtyard is perfect for alfresco aperitifs or canapés. Enjoy exclusive access to enchanting landscaped gardens and lake views. 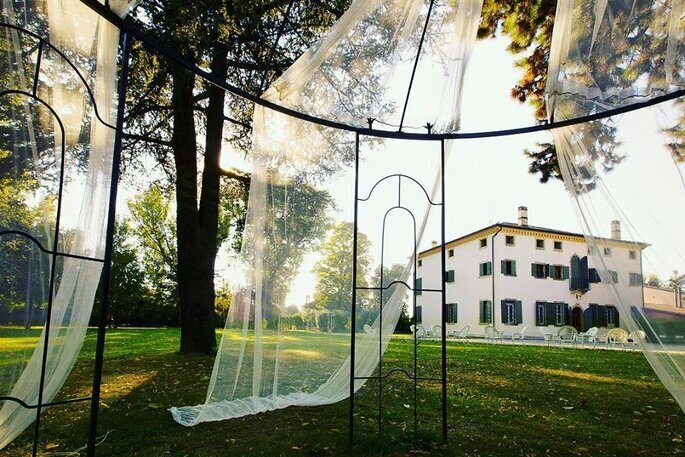 On the other hand, Villa Ormaneto is an ancient residence completely restored in the romantic province of Verona, where the charm of an ancient noble country residence is linked to an elegant and hospitable atmosphere surrounded by lush greenery. Old trees and well-kept green lawns offer an enchanting and ideal location for your wedding. Villa Ormaneto offers truly astounding Italian cuisine, always in keeping with globally loved gastronomic traditions, but with fresh seasonal ingredients. So what will it be? Are you a cosmopolitan couple seeking a city centre location in Rome? Or would you prefer the romance and authenticity of a Tuscan vineyard? 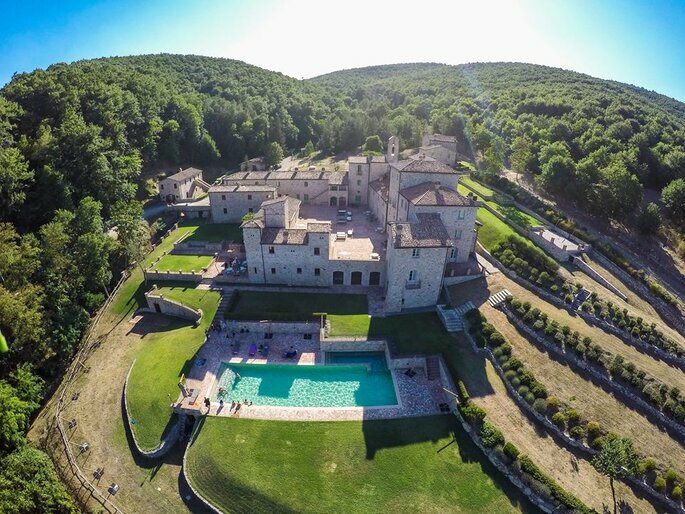 Alternatively, pick one of Italy’s historical villa venues for the fairytale day you’ve always dreamed of.